With the iPhone 4 came “antennagate” — iPhone 4 owners experiencing dropped calls if they held the iPhone 4 in a certain way. 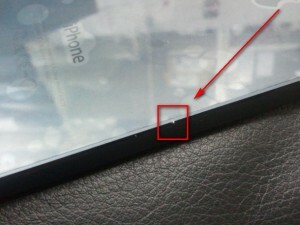 The iPhone 5  may soon be hit by “scuffgate”, as CNET puts it. There are multiple reports by iPhone 5 owners — on online forums, message boards, and social networks — that their brand new iPhone 5 has some sort of physical defection right out of the box; stuff like minor dings, nicks, scratches, and scuffs. In other words, some iPhone 5s are damaged straight from the factory. Of course the defections are minor and largely won’t affect the functionality of the device but no one likes a damaged brand new phone… especially if they just paid hundreds of dollars for it. Aside from complaints, multiple owners have sent in pictures of the damage, as you can see above. Apple  has yet to make an official comment on this matter so it isn’t entirely clear what Apple’s response to scuffgate will be. Hopefully they will do the right thing and offer refunds or exchanges to people with affected devices. iPhone 5 may survive falls really well , but damaged goods coming from factories surely doesn’t make up for it. Be sure to let us know in the comments  below if your iPhone 5 has similar damage.